Wah! I'm itching to plant something! I can't stand it! Reading about all you folks in the warmer parts talking about your growing seedlings, direct seeding, or even PUTTING transplants IN THE GROUND!!! Hereabouts, it was 18Ã‚ÂºF outside this morning ! "I DON'T want to start my seeds too early"
My gardening schedule, carefully planned out, calls for earliest spring seeds to be started March 1. I still have to set up the seed starting area. What do you think, would they be better off with a bit MORE light? You know, I have found a simple Amaryllis bulb has helped me resist the "plant too early" itch. It has been SUCH a joy watching it grow literally nearly an inch in height every day, and then watching those buds develop. Any day now, the flowers will open. The anticipation has been wonderful. Not only is it still a bit too chilly to plant where I am, at the moment my yard is under about 3 inches of water. This is not all that unusual of an occurrence for a couple of weeks during the winter monsoon season, so from experience, I know that the water will drain away as soon as there is a 24 hour period without rain. There's always something to plant! I'm in zone 6 in southern Ohio and our 50% last frost date is around April 15. 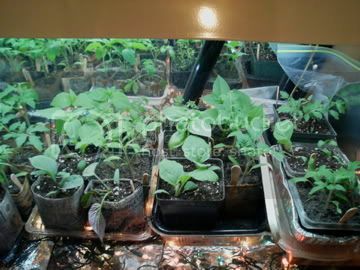 But I start the first seeds indoors in Jan. Not only the cold tolerant stuff like cabbage and broccoli. But you can start perennials from seed. Anything winter hardy can be started early. This year I did coreopsis. Perennials are also slower growing than annuals. Some things are very slow growing, for e.g. rosemary. Also I have noticed that purple & red basil are for some reason much more slow growing than green basil, so I start it two weeks sooner. 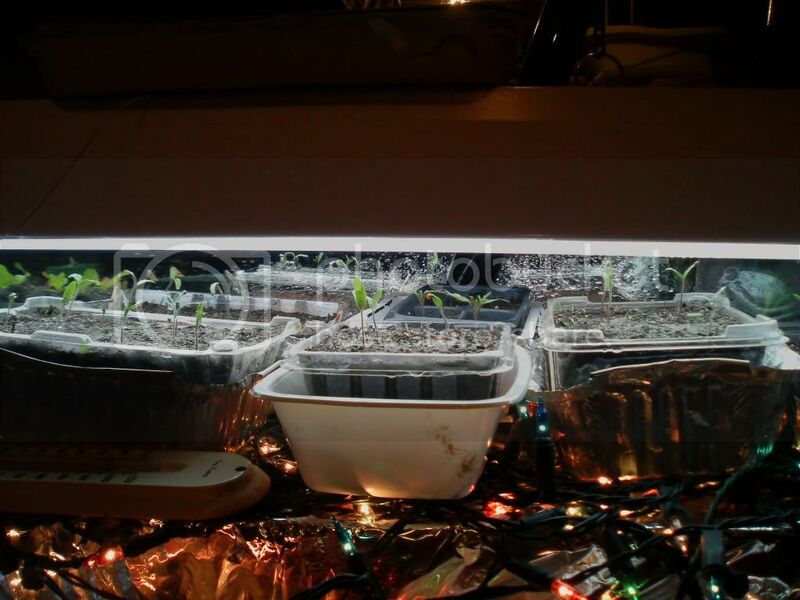 So right now I have 9 trays under lights, soon to be more, and my tomatoes, started mid Feb have their first true leaves.... Feel free to plant! Yep, the earlier the better IMO, for things that transplant well. It is important to keep the plants warm enough however. I try to keep them with bottom heat or in the warmer places in our greenhouse. I've noticed for pepper plants and to less extent tomatoes, that are repeatedly exposed to prolonged temperatures in the 50's may take weeks to recover from that shock. 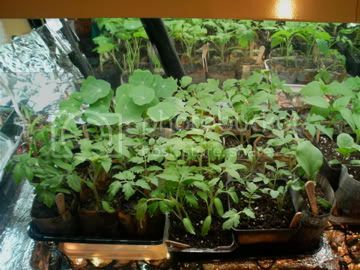 So if those kinds of temperature sensitive plants can't at least have their roots kept warm, in the upper sixties or warmer, except for relatively brief drops below, then a person is better to wait until later to plant the seeds. Tractor Supply has seeds on display. Red and White Onions were set deep. The one cabbage and one broccoli have emerged! In only 3 days! I can't WAIT to start the full production tomorrow!! !!! I DID IT !!! Spent the PM setting up the lights, making seedblocks and planting seeds. 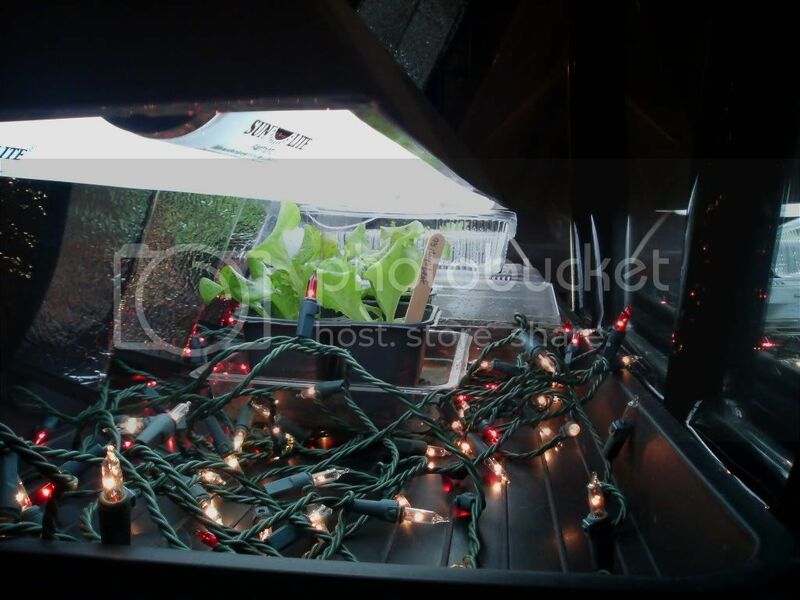 I WAS going to go buy some shoplights, but, when I found out my Dad isn't using the grow lights I gave him, I couldn't load it in my car fast enough! I'll expand later if necessary. I have an 80's black lacker-with-brass-trim drawers/mirror in the garage for which, FORTUNATELY, I couldn't find any Freecycle takers. 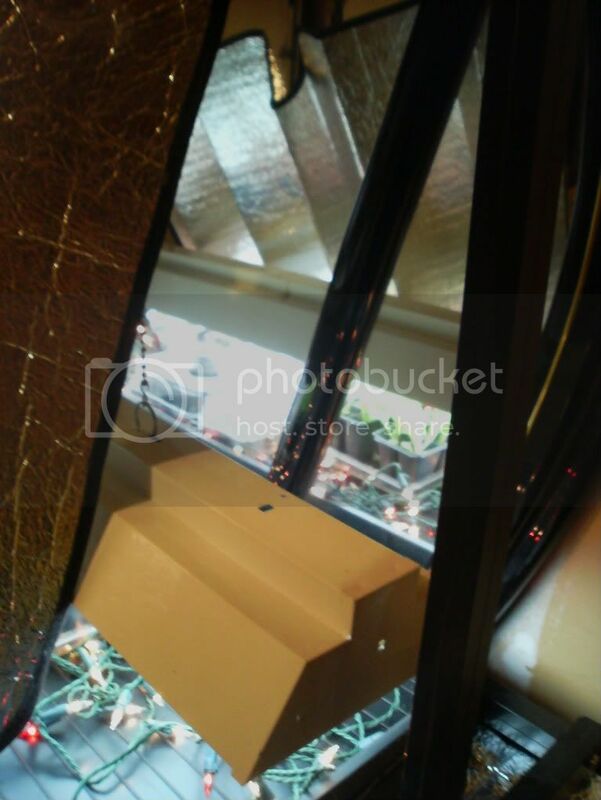 A nice height surface AND the big mirror is the added bonus for reflecting the light and warmth. Looked around the garage and spotted a couple of promo windshield sunshield -- PERFECT! -- to protect the drawer top AND to boost the light even more!! Then, I couldn't find the heating pad, BUT there were yards of Christmas lights handy. GREAT -- gentle bottom heat PLUS extra light PLUS keep in the heat a little more. Need all I can get since my garage has no windows, and it's pretty cold -- 44Ã‚ÂºF vs. 36Ã‚ÂºF outside. (Tonights forecasted low is 12Ã‚ÂºF! and it snowed last night and more to come -- brr!) I think it was jbest's LED light link that led me to use the RED Christmas lights. I'll add a string of BLUE's when I find it. 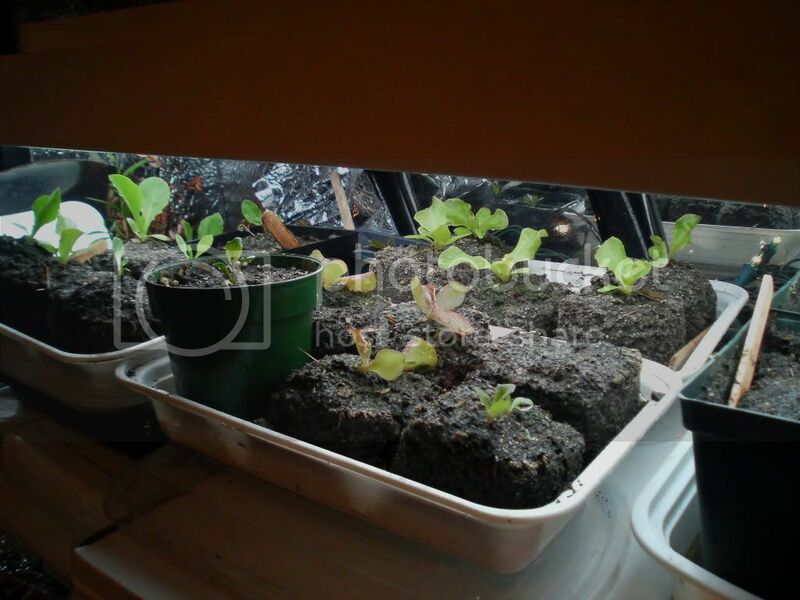 The sprouted cabbage, broccoli, and romanesco cauliflower have been moved under the lights, these lettuce are getting repotted later on, and the onions will stay here to sprout. The big tray of more cabbages, broccoli, romanesco, and heading lettuces have been squeezed into the Winter indoor garden upstairs since the test seeds sprouted so well up there. They can come downstairs after they sprout. Today's mantra has been "DON'T FILL UP THE GROW LIGHT AREA"
Last edited by applestar on Sun Mar 01, 2009 11:43 pm, edited 2 times in total. I got nervous about the impending 12Ã‚ÂºF low tonight and completely draped the Grow Light Area with heavy plastic sheeting. As predicted, it got REALLY cold. The bucket of water I left in the garage had 1/4" ice on it and the left over seed starting mix was lumpy and frozen. 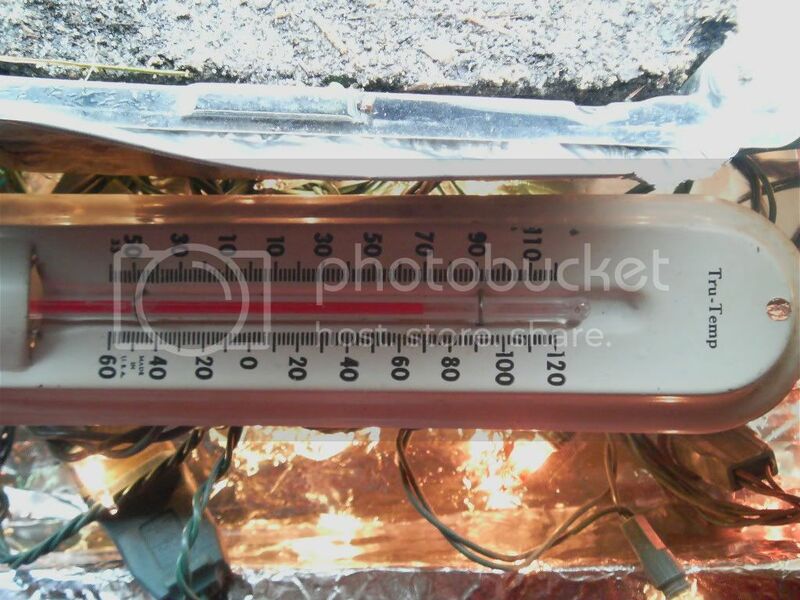 HOWEVER, the thermometer on the X-lights towards the front of the tray read 55Ã‚ÂºF, and the lettuce starts were looking a little chilly (not as perky as when they were in the balmy 60's Winter Garden) but fine (not frozen). 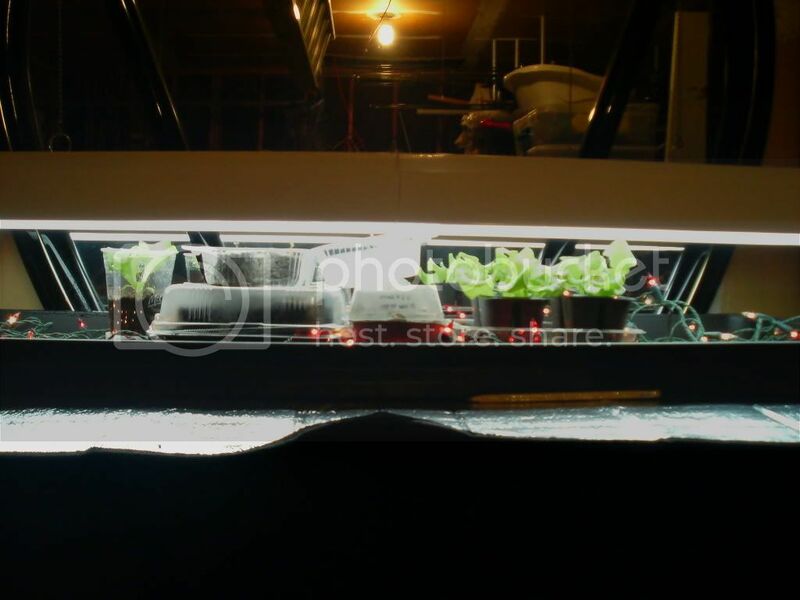 So the Seed Starting/Grow Light Area is performing as designed and expected. At the moment, we are talking cruciferous veggies, head lettuces, and onions so they should be OK. I've always had more probs from things being TOO warm for them inside the house in the past. I'm just letting the crucifers sprout upstairs first so they'll have a bit more warmth to start with, then they can go out in the GLA. 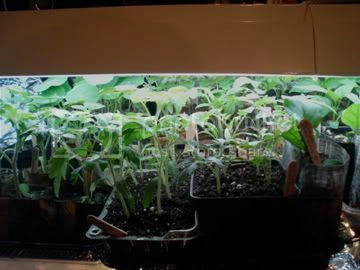 Later on, for toms/peppers/eggplants, I may have to up the heat with more X-lights, but the ambient temp in the garage will be above freezing by then. !! BUT !! To my annoyance, SOMETHING ate the wee cabbage, broccoli and romanesco cauliflower sprouts !!! Not sure what it was, but I guess it woke up in the compost and ate the first tender green morsel it found. I'm not that upset since these were just test sprouts (in fact, you might say even in death, they've performed a valuable service.... ), but I'll have to keep an eye on the main tray. I made more soil blocks after thawing the seed starting mix inside in a patch of sun. 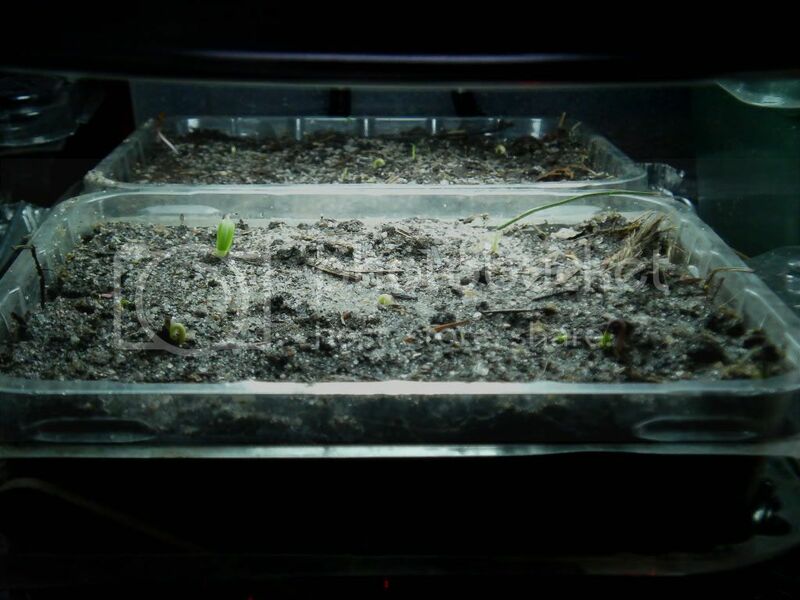 Congratulations on maintaining a nice, safe temp for your seedlings. Unfortunately, it also seems to have been comfortable for Something Else. 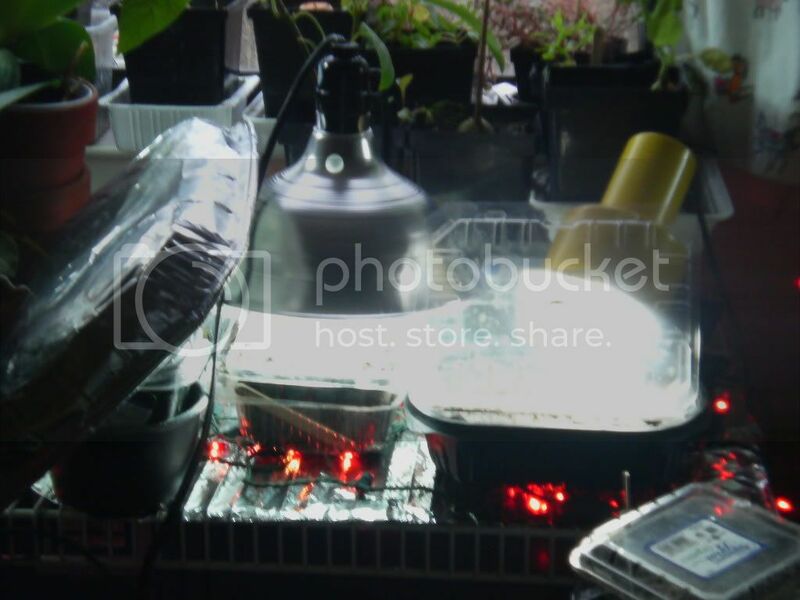 I added another string of X-lights and now the thermometer on the lights reads 75Ã‚ÂºF and on the top edge of pots read 68Ã‚ÂºF during the day. 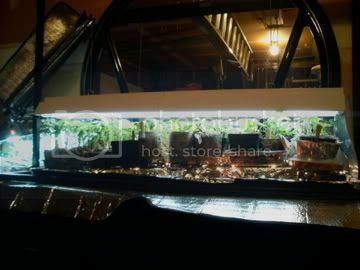 Just about right since most of the sprouted trays are raised above the lights. In the mean time, overnight low was 9.5Ã‚ÂºF outside! One more cold night, then things are supposed to warm up. 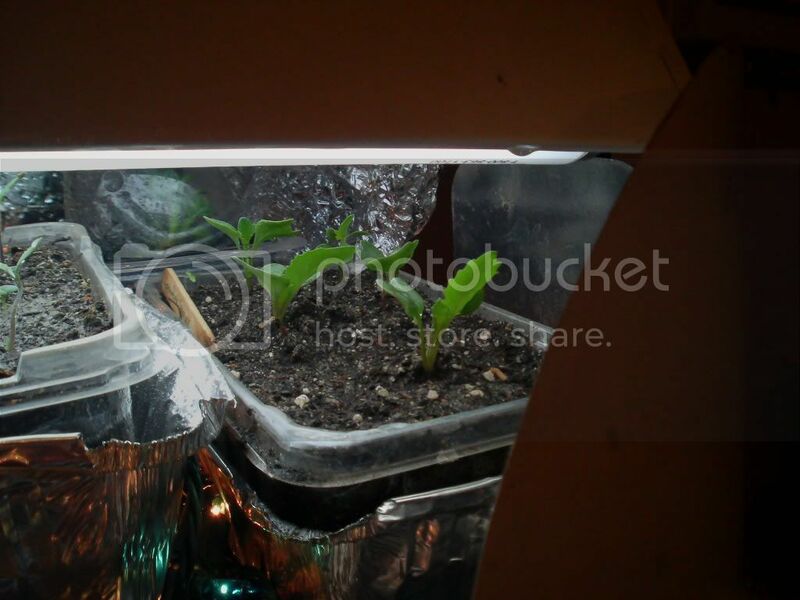 The inexpensive windshield sunshield (accordion folded, mylar covered foam) is working great as a light reflector/insulation, and with the double layer of heavy plastic tent to keep out the cold, things are staying nice and cozy in the Grow Light Area. 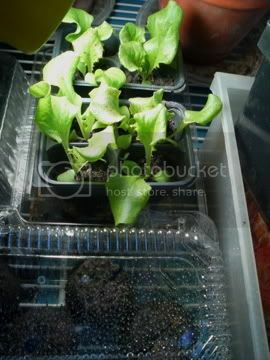 A new tray of sprouted cabbage seeds went out to the the Grow Light Area. It's a small pointy variety called Caraflex that seems to germinate in just 1 day! ... a bunch of heading lettuces sprouted both inside and out in the GLA ... also a smattering of onions ... and a seed block of English thyme. We're off to a good start. 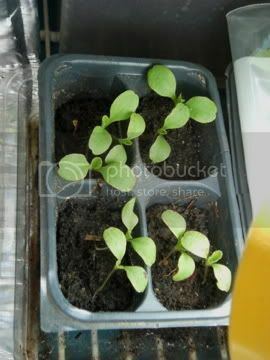 Keep your fingers crossed for me that nothing happens to the li'l seedlings tonight. Those lettuce were planted out in the raised bed, fenced sides surrounded with heavy plastic sheeting and clear egg cartons (I'll post a photo when I can) and covered with spun-bonded poly. They are doing extremely well so far. During the day yesterday, the temp climbed to 75Ã‚ÂºF when it was in the 50's outside. The unheated lettuce and cabbage sections were 60Ã‚ÂºF this morning, which is probably about the right night time air temp for the tomatoes. I won't move them out to the garage until the air temp steadies above 65Ã‚ÂºF. In the Grow Light Area, it's a perpetual puzzle trying to maintain the same foliage height across the table, shuffling the taller growing ones down to lower levels, tucking one paper pot here, another one there.... And they all have to be shuffled around again every time a community pot gets uppotted! Im itching to get started. 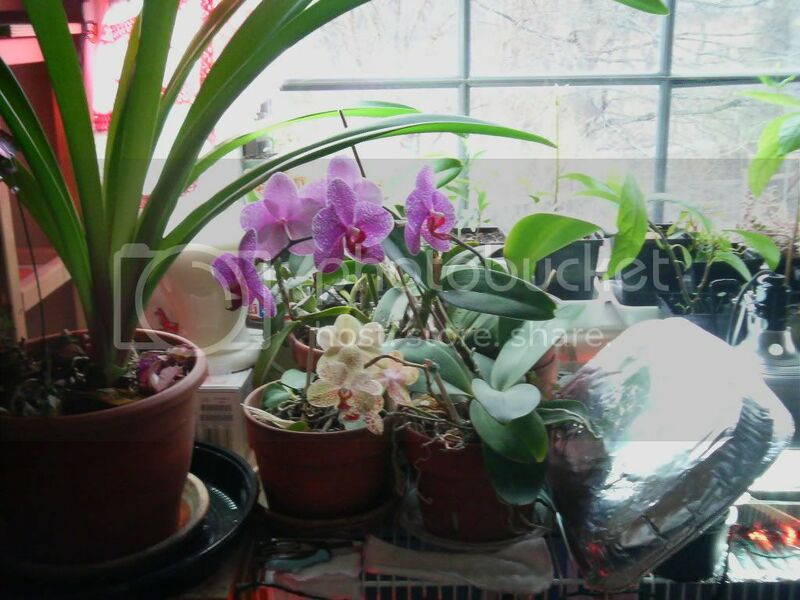 When to start plants indoors.